There has been so much hype around this book, that I have been a little nervous about picking it up, but so many of my good friends have recommended it to me that I couldn't shy away. 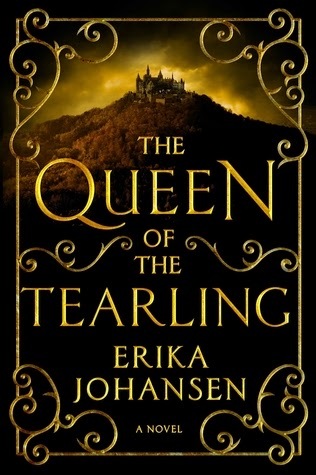 And to be honest I am glad I didn't, this book was such a great read, there is so much to learn about the land of the Tearling and the history behind everything, that I found myself immersed and wanting to come back to this world that Johansen has created. The characters are all so unique and I wanted to know more about some of them, but this is mainly a book about Kelsea coming of age and really growing up during a difficult time. She has been hidden away for years and trained to learn about the Tearling kingdom, because she is destined to take over. Readers see that Kelsea has a lot to deal with when she gets to the kingdom, so much has changed and she has a lot of work to make this kingdom better and bring a lot of change. Erika Johansen takes her time introducing everything and that is what makes this book such an amazing opening to a series. Not only is there a lot of information, but there is also some great action mixed in with the story. Kelsea seems to be a sheltered girl with no knowledge of the kingdom but she has a team of guards to help protect her, and trust me, there is a lot of danger around her. Kelsea needs to prove herself and I love how her attitude really shines and she proves that she can truly be a leader. Not only does Kelsea have to learn to rule but she has her own life to figure out, she needs to learn who she is as a person now that she is in this new position and no longer in hiding. Kelsea is unsure if she is prepared for this job, but she will try to do her best, and I am so excited to see what things she does next to really take control of the Tearling. I will say there were a few times that I felt I lagged while reading this book, but all in all I wanted to keep coming back to it and see what else Kelsea would do. I loved watching her change over the course of this book and really come into her role as a queen. I think if you are a fan of fantasy books, this is one that you should add to you pile, it has a little bit of everything but the story takes it's time and really lets the reader get to know everything instead of just throwing you right in the middle of the story. One of those books everyone's talking about.. Thanks for you review, adds a little perspective! :-) I might read this after all. I was scared away from the massive info dump from the back of the book alone! I may have to give it a shot.